After 20 years of Iyengar practice, Cinnamon Evans finds yoga stills a ‘mindy noise’ – the mental chatter you have before you get to class. Luck brought her to Maghie Mills Iyengar School in Brunswick . (Mills had studied alongside Griffins Hill’s Frank Jesse.) She was working at Melbourne’s environmental park CERES, in Brunswick East, where she’s been for 23 years. She’s now CEO. She still laughs about the first time she twisted her words when speaking with her partner. Mindy noise became their inside joke. But the mental emotional wellbeing, stress management, and meditation have uncovered another treasure: the idea of union. “It took a while for me to really get that,” Cinnamon says. “Now I totally get it. There is no end point to yoga practice. There is only progression.” “I didn’t go to that first asana class looking for a spiritual practice. But I found one,” Cinnamon says. Cinnamon practices her yoga three times a week, finding time between the demands of her job. 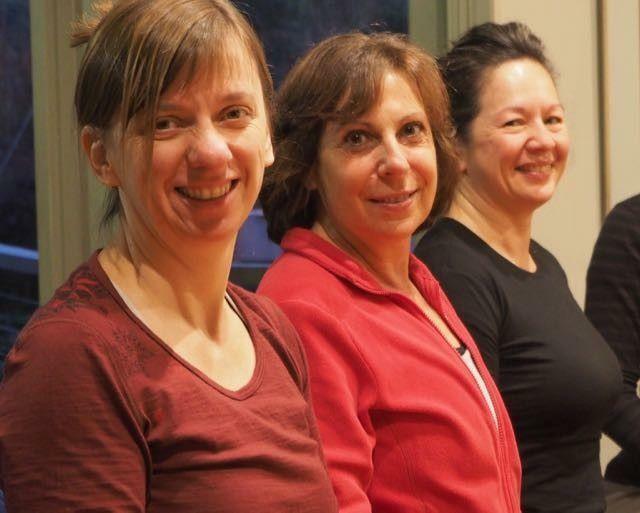 “There’s something special about the Iyengar system – its attention to detail, alignment, and props. It’s very sophisticated,” she says. “I haven’t found another style that satisfies me in the same way. Cinnamon discovered so much more than fitness, strength and flexibility. The subtle layers of Iyengar yoga have surprised and captivated her. “It’s about opening the body; discovering the relationship between the body, the emotions and the mind, consciousness and connection to the divine. All of those layers are present when I bring my awareness to what is going on for me on the yoga mat. Instantaneously attracted to the beautiful antiphonal sounds of Bhakti yoga, Cinnamon embraces this into her practice too. She discovered Bhakti at a camp in 2014. It includes Kirtan, a call-and-response chanting of mantras, usually in Sanskrit, to music. 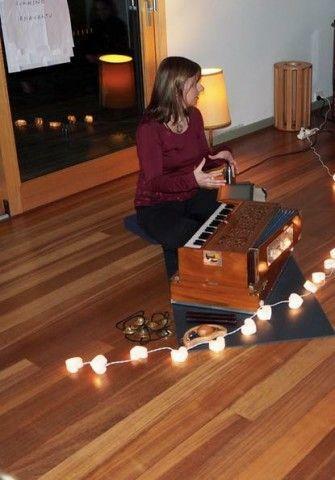 It inspired her to learn a musical instrument for the first time in 35 years, forming a Kirtan band, Bhakti Sunset to practice the devotional form of yoga. Bhakti Sunset will lead a session at Clifton Hill Yoga Studio’s 20th anniversary in September, where Frank will also run yoga classes. When a yoga class moves into Ardha Chandrasana (half moon pose) Cinnamon inwardly cries “yes”. It’s one of her favourite poses. “There’s something really graceful about it,” she says. Her other favourite poses include Vasiṣṭhāsana (arm balance) and Janu Sirsasana (head to knee pose). Join Frank and Cinnamon at the Clifton Hill Yoga Studioanniversary in September. “Yoga means union. The union of the individual soul with the Universal Spirit is yoga. But this is too abstract a notion to be easily understood, so for our level of understanding I say that yoga is the union of body with the mind and of mind with the soul.” – BKS Iyengar, Tree of Yoga. Join over 2,500 of your peers and get monthly articles delivered to your in box.